In Canada, one in five people suffer from these ailments that unfortunately cannot be cured. It is possible, by using different methods, to significantly reduce the pain and side effects caused by arthritis. Osteoarthritis and inflammatory arthritis can cause swelling, pain, stiffness, restricted mobility, fatigue, and damage to joints and other tissues. These pains reduce the quality of life of those who suffer from it and can affect the general mood and mental health of many of those affected. • The appearance of bone bumps on the joints of the tip or middle of the fingers. Arnica with its anti-inflammatory properties, reduces pain and facilitates the mobility of joints in a natural way. The reduction of inflammation in the joints allows to have better mobility and to reduce pain considerably while attending to daily activities (work, household chores, cooking, etc.). According to several sources, arnica would be more effective than taking ibuprofen. With 20% Arnica Montana, our products are currently the only painkillers that contain a really effective concentration of this plant with anti-inflammatory properties. In addition, our products work on all types of arthritis (osteoarthritis, rheumatoid arthritis, etc.). Enjoy the relief provided by Novarnica! If you are using oral treatments, no need to worry! 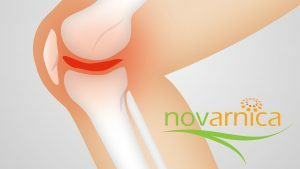 Because Novarnica is a topical pain reliever based on natural ingredients including Arnica Montana, there are no known interactions with other medications. If you still have any hesitation or need more information about possible interactions, we recommend that you consult a healthcare professional. For more information on arthritis, visit the Public Health Canada website.